VATICAN CITY—Pope Francis has ordered an investigation of an American bishop accused of sexual misconduct with adults and accepted his resignation, deepening a worldwide clerical abuse scandal. The Vatican and U.S. Church officials announced the investigation on Sept. 13 as the pope was meeting U.S. Catholic Church leaders to discuss a scandal that has shaken his papacy. The Vatican said the pope had appointed Archbishop William Lori of Baltimore to run the Wheeling-Charleston diocese, West Virginia until Bishop Michael J. Bransfield is replaced. In Germany, a Church study published in a magazine on Sept. 12 showed 1,670 clerics and priests had sexually abused 3,677 minors, mostly males, in the country between 1946 and 2014. On Sept. 13, the archdiocese of Baltimore’s website said the pope had ordered the archbishop to investigate allegations of sexual harassment of adults by Bransfield. “My primary concern is for the care and support of the priests, and people of the Diocese of Wheeling-Charleston at this difficult time,” Lori said in a statement. 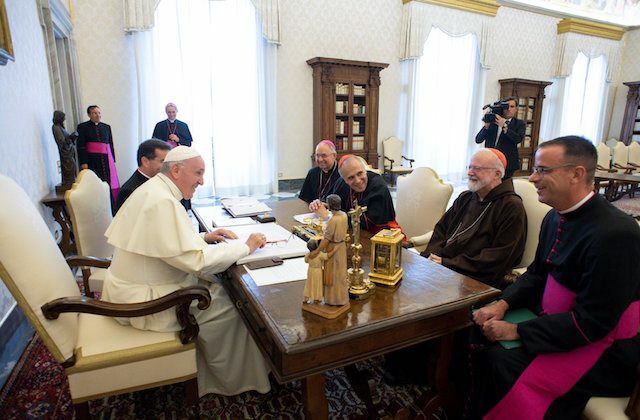 In a statement afterwards, DiNardo said they told the pope of “our situation in the United States—how the Body of Christ is lacerated by the evil of sexual abuse.” He called the meeting “a lengthy, fruitful, and good exchange”.